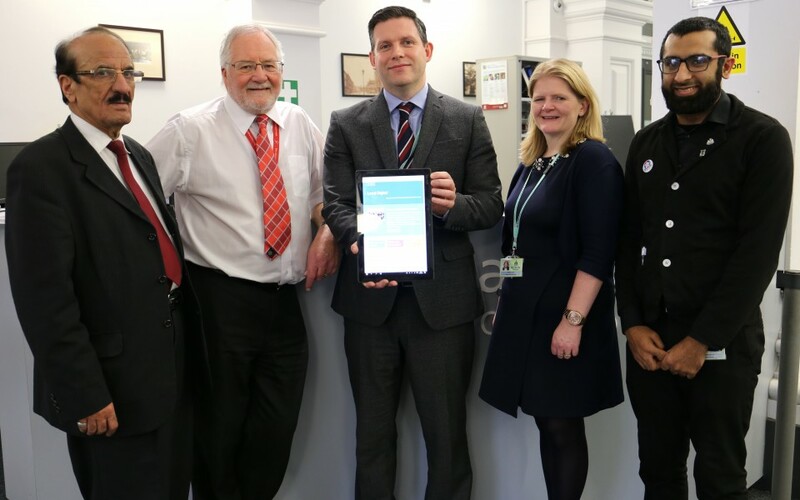 Pictured left to right are: Cllr Mohammed Khan (Leader of Blackburn with Darwen Council), Cllr Andy Kay (Executive Member for Resources), Paul Fleming (Director of Digital and Business Change), Denise Park (Deputy Chief Executive) and Hussain Mulla (Customer Service Advisor). Blackburn with Darwen Council has signed a government backed initiative which confirms its commitment to improving digital services. delivering better value for money. Councils across the country have signed the agreement which was initiated by the UK Ministry for Housing, Communities and Local Government (MHCLG), the Government Digital Service (GDS), and a collection of local authorities and sector bodies from across the UK. Digital initiatives at the Council include digital health innovations and the roll out of tablets for children and adult social workers to improve mobile working so they can spend more time working with families and less time on completing paperwork. Signing the Local Digital Declaration also helps to improve the Council’s chances of receiving funding for digital projects in future. This Council wholeheartedly supports unlocking the enormous potential of digital ways of working and we have made massive strides in the last few years to improve our digital offer to our residents. Signing this declaration makes our commitment crystal clear and is a really positive step. Of course, digital is not the panacea to solve every problem our residents and our borough faces but it is something we must harness as it will help us transform services to benefit the residents we serve.